Walking through the untouched landscapes of Northern England. Helmsley Castle and the remains of the Norman Rievaulx Abbey. Cliff top walking along the east coast, with sea views. Crossing open heather moorland skirting the North York Moors. Whitby Abbey, the Captain Cook Monument and Robin Hoods Bay. The Cleveland Way explores an untouched area of Northern England where dinosaurs once used to roam. 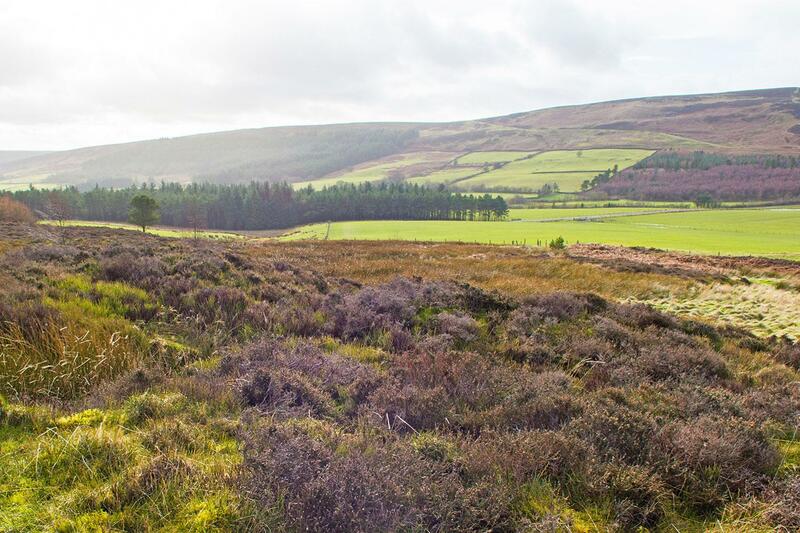 On this trail of varying landscapes, from high cliff tops to peaceful moorland, you will continually skirt the North York Moors National Park. Here pilgrims found peace and settled on these moors creating important abbeys and churches, the remains of which can still be seen today. Wander through historic villages, explore picturesque old shops, and enjoy local hospitality. Revel in the impressive views over the Cleveland Hills and also pass Rock Cliff, the highest point in Eastern England. 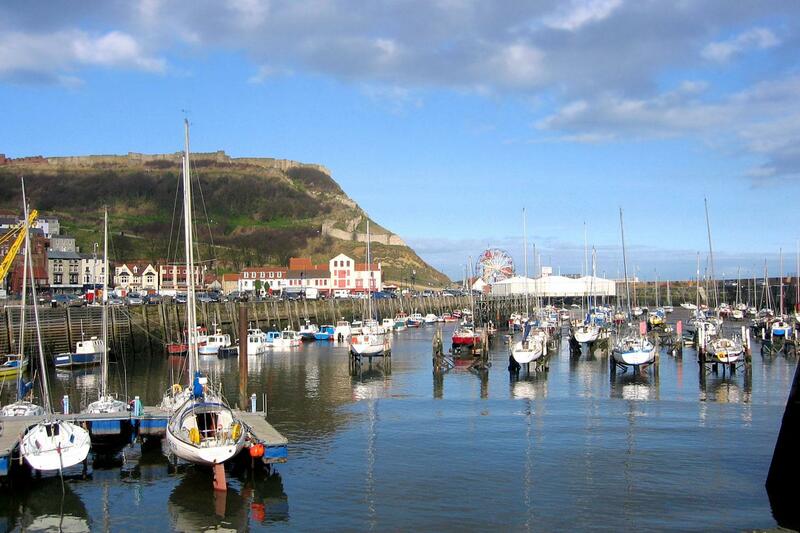 This journey also hugs the coastline and takes you through such charming seaside towns as saltburn-on-Sea and Filey. This is a general section by section guide. For all the available day by day itineraries, please see the options on the right. Take time to wander around the historic village of Helmsley with its picturesque old shops clustered around the market square. The first highlight, Rievaulx Abbey ruins are worth the half a mile detour off the path, set in the wooded valley of the river Rye. As you approach Sutton Bank the Kilburn White Horse - a limestone horse created by removing down turf can be seen. The views from Sutton bank are wonderful and the walking easy with a few climbs as you follow the old drovers road to Black Hambelton. The Days walking ends in Osmotherley; a quaint village with old pubs, shops and cafes. This is the most strenuous part of the walk, like a giant rollercoaster walking up and down the Cleveland Hills. The views are stunning across the heather clad moorland and the deep valleys to the south. After Clay Bank Top a steep climb leads you to Round Hill and the summit of Urra Moor which is the highest point on the walk. Walking across the moors provides for fantastic walking although watch underfoot as some of the paths can be boggy. The path slowly descends to Kildale passing many burial mounds and boundary stones from the past. 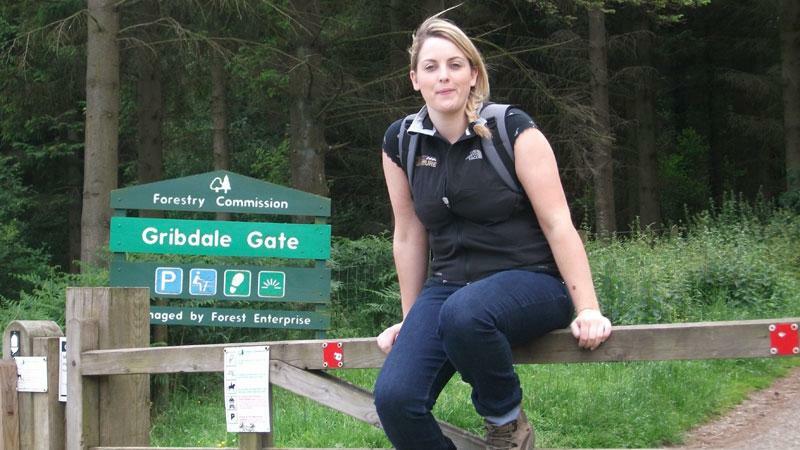 The first part of the walk is dominated by the climb up Easby Moor to Captain Cooks Monument. 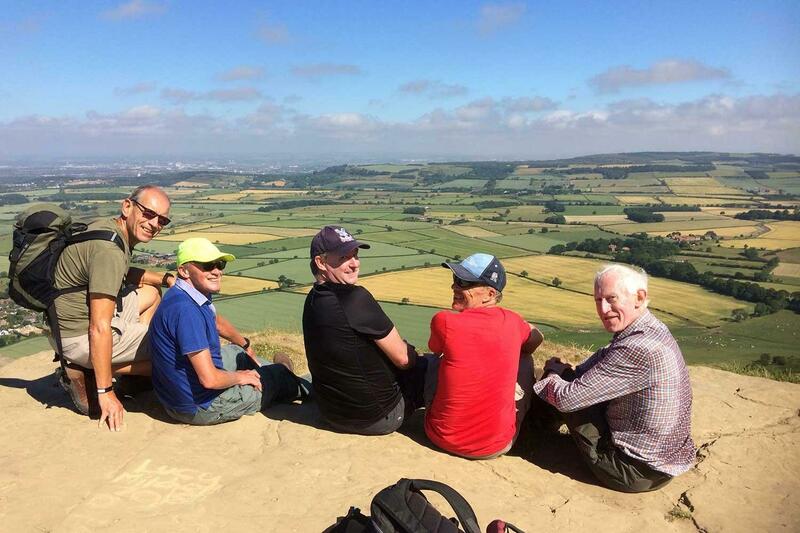 You are then given the opportunity to climb the eroded sand stone stump of Roseberry Topping. 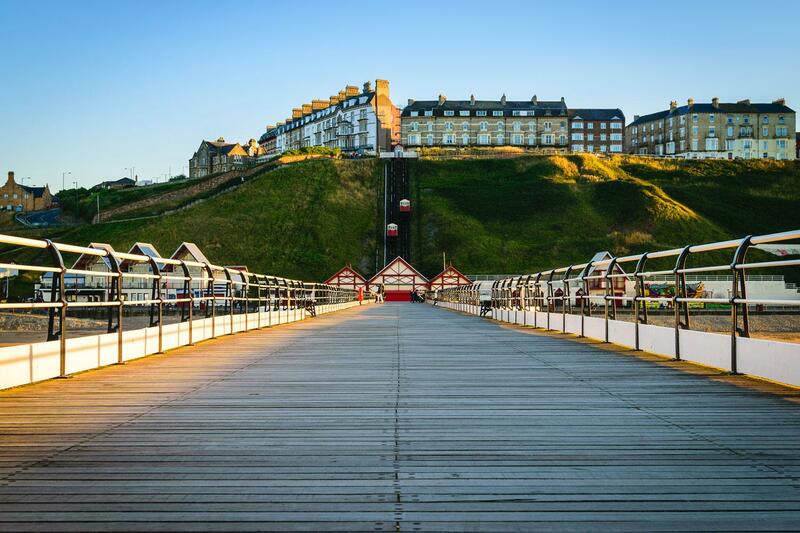 The walk continues through farmland, woodland and a riverside path leads you to the coastal town of Saltburn-by-Sea where you leave the moors behind and prepare for cliff-top walking along the coastal section. From Saltburn the walk now hugs the coastline all the way to Filey. You climb up Hunt Cliff and walk along dramatic sections, passing Rock Cliff (the highest point in the east of England). The path then descends to the pretty village of Staithes with its fleet of Cobles (flat hulled fishing boats from Viking origin). 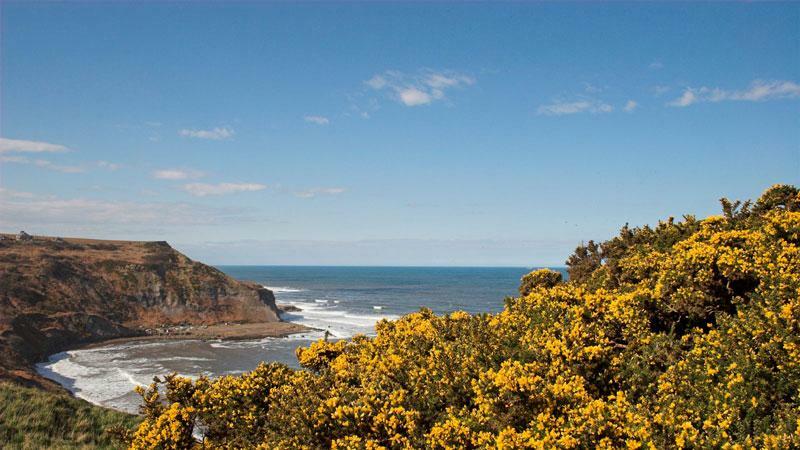 More dramatic coastal paths take you to Whitby with its picturesque harbour and town steeped in history. High above the town are the remains of Whitby Abbey. Following on past some small beaches and rock wave cut platforms takes you to picturesque Robin Hoods Bay. The final stage of the walk heads through the seaside town of Scarborough, where you pass busy beaches with traditional seaside entertainment, very different from the untouched villages you will have passed until now. 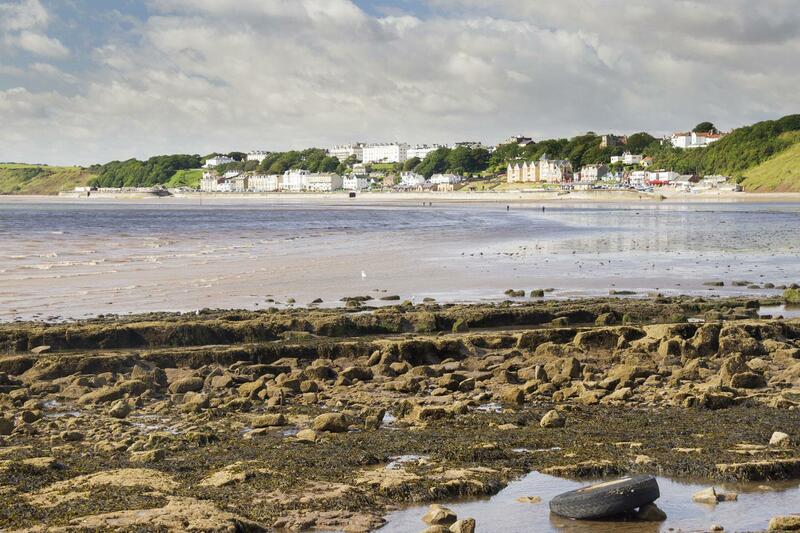 As you head down to Filey, look back at the vibrant colours from South Cliff and reflect on your walking adventure. One of the highlights of this tour is the friendly and welcoming accommodation. We specifically choose the small hotels, inns, guesthouses and B&Bs to ensure that you enjoy every minute of your stay. All offer a warm welcome to walkers, traditional hospitality and delicious local food. This holiday is available to solo walkers, although a single supplement is payable. If you require single rooms within your party we would be happy to accommodate your request, although it is not generally possible to secure more than three single rooms in a party. A single supplement is payable. A hearty breakfast is included each morning. Lunch and dinner are not included so you are free to choose from the available options. Most of your accommodations will more than happy to provide a packed lunch on request and this can be booked on arrival. Dinner is available either at your accommodation or nearby pubs and restaurants. Red Roofs offers comfortable bed and breakfast accommodation and has a lovely sheltered garden at the rear of the house in which you can relax over a pot of tea or coffee with. The Three Tuns provides accommodation in the centre of this wonderful little village of Osmotherley, you wont have to walk far after your days walk as they provide delicious home cooked food in the restaurant. The Wainstones provide a friendly and comfortable stay to walkers and all rooms are en-suite.They are located just off the path and provide a complimentary transfer service from Clay Bank Top. Susan and Stewart Morgan welcome you to the Victorian guesthouse and cottage, located in the heart of Saltburn. 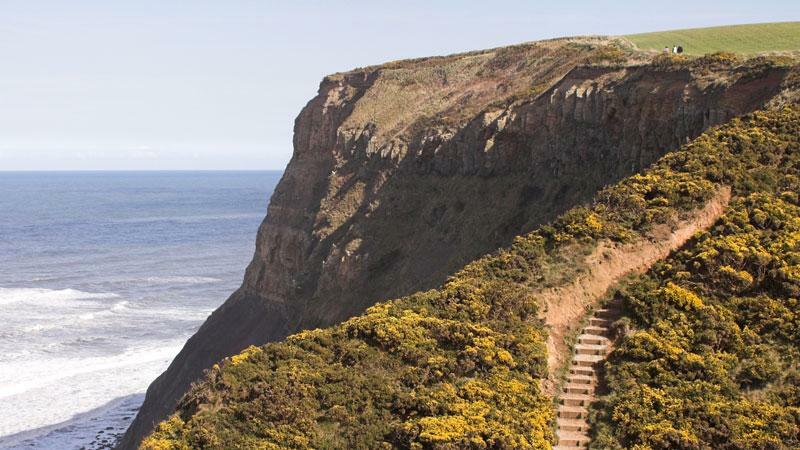 Only five minutes walk from the beach and the breathtaking Cleveland way. The White Linen Guest House is a beautifully renovated Georgian townhouse offering high quality B&B to visitors. This Well appointed Hotel has lovely en-suite rooms offering comfortable and clean accommodation for walkers. They provide evening meals and are very close to North Bay Leisure Park. With over 25 years experience the owners at Seafield appreciate guests needs and pride themselves on the comfortable en-suite rooms and great breakfasts. This walk is graded moderate and follows footpaths, tracks and cliff paths as well as traversing through fields and moorland. Some of the ascents and descents are steep and can be exposed so require a good head for heights and sure-footedness in places. Please make sure to take extra care when following paths near the cliff edges, especially in wet or windy weather conditions. You should have a good level of walking fitness to get the most from this tour. Most the Cleveland Way is waymarked and you will also be supplied with a detailed map and guidebook so you should have no problem following the route each day. Your bags will be transferred from your accommodation as per your itinerary and moved onto your next overnight accommodation. We ask you to limit your luggage to one bag of up to 20kg per person. Please ensure that you do not bring more than one bag of 20kg, as if this occurs, the luggage transfer company will ask you to pay an additional fee (approx. £8.50 per day, per bag). This additional payment, should it be necessary, needs to be made locally to the driver and in cash. Any additional bags need to labelled as if they are not labelled we cannot guarantee that they will reach you at the next accommodation. If you are travelling from far afield and do have more than one bag it is possible to arrange for the extra luggage to be stored whilst you are on the tour for a fee of £25 per bag. These additional bags would be picked up at your accommodation at the start point (Helmsley or Saltburn-By-The-Sea) and dropped off wherever you finish depending on the itinerary you choose to do. Please contact us if you are interested in this option. It is a requirement of booking this tour with Macs Adventure that you have suitable travel insurance which covers for the activity and emergency evacuation and hospital care. The distances and ascent/descents are approximations of the recommended routes. Please be prepared by packing all necessary items, for example proper rain gear (jacket and pants), sun hat and sunscreen. Your information pack has a detailed equipment list which includes standard walking gear such as a good walking boots, warm and waterproof clothes for the cooler months and lightweight clothing for the summer and also a day pack. By Air—The closest airport to the start of the walk is Leeds Bradford International, from here you can catch a train to Malton (55 mins) which is 16 miles from Helmsley, then either a bus or taxi to Helmsley. By Car—If you plan on driving there is a car park on the north side of town and you can buy weekly parking tickets from the Tourist Information in the market square. There are frequent trains from Filey to York, from where there are good connections throughout the UK. If you need to head back to Hemsley then you can catch the train to Malton, and then take a bus/taxi to Helmsley. 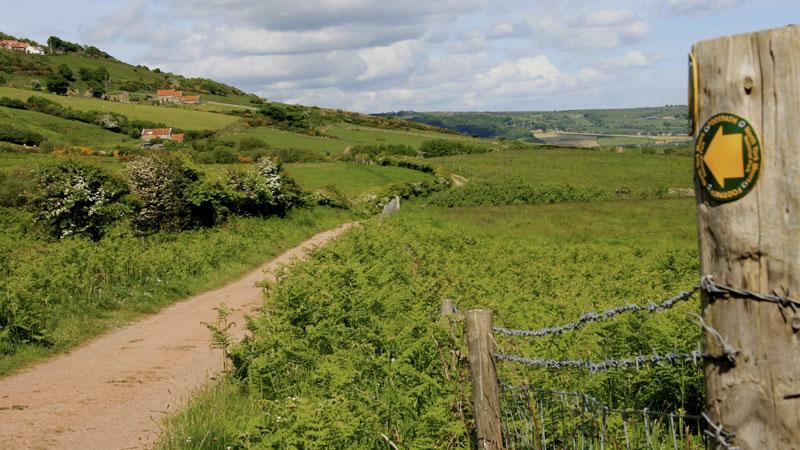 For the moors and coastal section of the walk there are frequent trains from the south to Saltburn, and you can catch a bus or a train back to Helmsley from Filey. We are able to book transfers for you as requested - please just get in touch. Full public transport information is detailed in our Information Pack, which we send out with our booking confirmation. Accommodation in carefully selected B&Bs, Guest Houses and Country Inns. Door to door baggage transfer. A detailed pre-departure information pack, guidebook and map per party. Emergency telephone support from our office in the event of a problem. Travel to the start or from the finish of the walk. Lunches, dinners, snacks and drinks. We offer a range of itineraries so you can choose your preferred daily distance so hopefully you will find an itinerary that suits your preferred level of fitness. If you currently don’t enjoy an active lifestyle we suggest regular walking in hilly terrain supplemented by cardio vascular exercise for at least 6 months prior to your walk. A good gym or personal trainer will be able to draw up a personalised training programme. We suggest you book as soon as you know your plans as the Cleveland Way is extremely popular especially over April/May and July/August. What personal equipment do I need? You will need good walking shoes/boots (ideally waterproof), comfortable walking clothes, waterproof jacket and trousers, a daypack and hats/gloves etc. Traditionally April/May has always been the most popular time of year because the theory goes that the weather is better. Although I believe any time between April and October offers a wonderful experience. Which direction should I walk? We only offer this holiday from Helmsley to Filey in one clockwise direction as the baggage handlers only operate in one way. Am I able to take my dog? Unfortunately we are unable to accommodate walkers with dogs as many of the accommodation providers we use do not accept pets. You can use public transport or local taxis to continue to your next overnight stop. The Moors Bus operates throughout the North York Moors. Well organised and good variety of accommodation; some on the path and others required a short diversion. Newton under roseberry was the furthest from the trail but you got the reward of climbing up roseberry topping. Organisation was flawless on this lovely walk across the North York Moors and along the line of cliffs from Saltburn to Filey. Accommodations were varied and well chosen, at appropriate distances along the path, occasionally facilitated by pre booked transport. Information was first rate in accuracy and usefulness. Most impressive was the swift and unfussy way in which Macs leapt to and organised the whole trip with less than 5 days' notice. Apart from the 16 or so miles the Cleveland Way shares with the Coast to Coast, this was a pleasingly quiet walk punctuated by points of cultural interest: abbeys at Rivaux and Whitby, for example and remnants of industrial heritage such as fan house and disused railway. We glimpsed golden plovers and heard the call of the curlew a few miles from High Paradise farm; a few miles short of Filey, we watched and heard the seals far below us on an isolated stretch of coast. The wind and view atop Roseberry Topping were exhilarating and the Turner like scene of Scarborough Castle from Holbeck Cliff was unexpectedly fine. I had a great time walking the Coast to Coast last year, and thought the Cleveland Way would be a little easier. Think again. Excellent walk, great views and equally challenging. C2C is almost twice the distance, but on a day to day measure, probably a little tougher, but highly recommended. Thanks Macs for a well organized and enjoyable trip. Accommodation was of the highest quality. I've done 5 long-distance trails in England and the Cleveland Way is now my favorite for its heavy concentration of gorgeous scenery and historical sights. 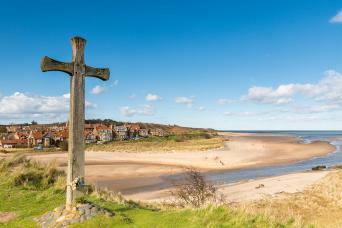 This includes moors, coastal cliffs, Rievaulx and Whitby Abbeys and Helmsley and Scarborough castles. 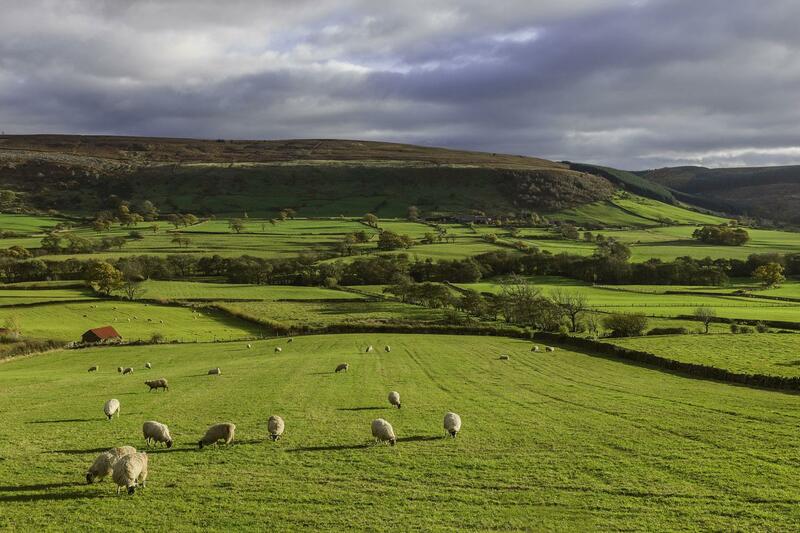 It's generally easier than the Coast-to Coast and Pennine Way walks, with the exception of two strenuous days in North York Moors National Park. Macs Adventure, which I've used about a dozen times, usually does a great job, but there were a few logistical problems on this trip that I'll mention. Many of the distances were understated, probably calculated using the standard daily destinations rather than the ones actually used where the hotels were located. I'll be specific regarding two destinations: "Kildare/Great Ayton:" The stated distance that day was 10 miles, when it was in fact 16 miles. The directions to the hotel, actually in Newton Under Roseberry, simply said it was "at the foot of Roseberry Topping just off the Cleveland Way." You actually had to climb up, over and down the other side of Roseberry Topping, itself already off the Cleveland Way, and then double back over trails for another mile or two asking people how to get to the hotel. "Sutton Bank:" Hotel is 2 miles downhill from here, which was doable going down to Kilburn, but difficult and redundant the next day returning uphill to Sutton Bank. Actual mileages are not 10 and 12 for Days 1 and 2, but 12 and 14. I realize that hotels are not always located close to the trails, but if it's over a mile, a shuttle is usually provided. Anyway, none of this should deter you from doing this trip. It's rich in beauty and history, and Macs generally does a great job. Mac's usual mix of excellent accommodation including a converted army camp at Staithes, now offers B&B. At Skinningrove we took time to visit the Ironstone Mining Museum, definitely worth the slight detour. We had a fantastic time walking the Cleveland way, the scenery was amazing, added to the fact we had glorious weather. The first few days are inland and the villages we stayed in were just lovely, then once we got to the coast the walk took on a different perspective with dramatic coastline and lots of undulating paths! All accommodations were great and the whole experience was one to remember! The Cleveland Way had it all, beautiful sceneries, good walks and good accommodations. Very friendly people in York !! A great walk full of contrasting scenery. Tough at times on the North York Moors but exhilarating at the same time. The footpaths were well maintained and the waymarkers first class. Plenty of wild life just keep your eyes open. We saw and Adder and a Slowworm on the paths. The East Coast Cliffs are crumbling and in several places there were detours inland. All in all a fantastic experience that should not be missed. My wife and I loved our walk. The scenery was amazing and we were blessed with perfect weather -- no rain and pleasant temperatures throughout. We started in Great Ayton and finished in Scarborough and the 15-milers on the first and last days were a bit challenging for a couple of folks in their late 50s. Also there were some serious elevation changes we weren't expecting.The accommodations varied, but were all adequate. All in all, it was a wonderful experience. If you are looking for a spectacular walk with both woodland and coastal walking then the Cleveland Way is for you. It has some challenging sections but it will be well worth it as you will be overwhelmed by the beauty of the area.